Today, June 3, Peter JW7QIA, Svalbard Island was worked for a new one. Around 17:30 UTC, signals were coming in and not much later, I could add a new one. As you can hear, the signal was not very strong and the CQ’s were unanswered. But as a surprise, signals were building later on, around 19:00 UTC. From about 19:15 to 19:45, signals were extremely strong and peaking over S9. Just incredible. This is a recording around 19:13 UTC. I cannot explain the doppler shift, very distinct around 1:05. A guess is aircraft scatter, but there could be other things in play as well. I will have a look into it. Peter: thanks for the new one! Well, I had a look into it. With Spectrum Lab, I tried to analyze the scatter. It does not resemble aircraft scatter. The waterfall does not show distinct lines, that cross the center frequency diagonally. Furthermore, the doppler shift periods are rather short, compared to what I have seen. The picture shows the waterfall for the second clip around 19:13 UTC. 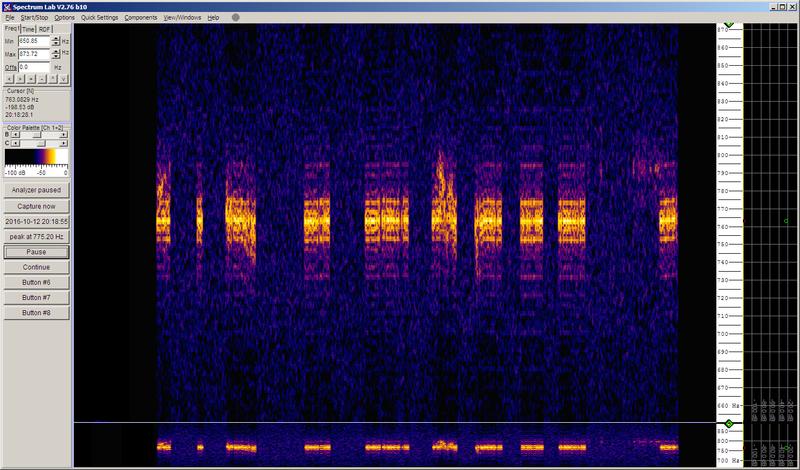 Near the end, it sounds like another staiton was calling CQ, just a bit above the frequency of JW7QIA.